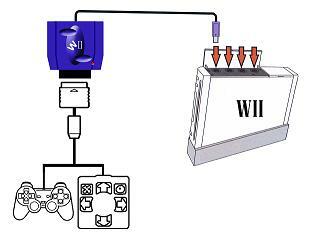 - Enables PS™ / PS2™ controller to work on GC™ / Wii™ console. - Programmable Auto Fire mode included. 1. #0801 Magic Path II will be recognized as a GC™ controller. or "classic" games, but not workable in Wii™ menu nor Wii™ games. 1. Make sure the GC™ / Wii™ console is turned OFF. 2. 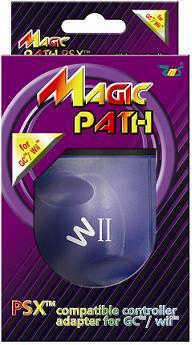 Connect #0801 Magic Path II to GC™ / Wii™ console. 3. 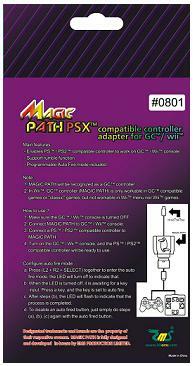 Connect a PS™ / PS2™ compatible controller to #0801 Magic Path II. will turn off to indicate that. the key is set to auto fire. c. After (b), the LED will flash to indicate that the process is completed. #0801 Magic Path II is fully designed and developed in-house by EMS PRODUCTION LIMITED. This is not a SONY™ nor Nintendo™ official product.